Letter from George Whitney President of Centenary Institute. 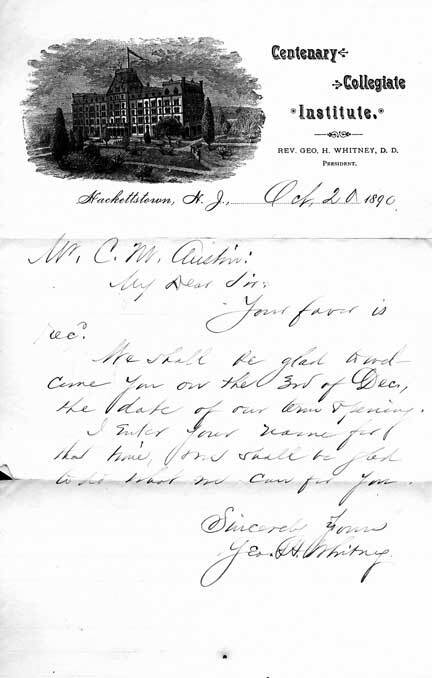 Mort Austin received an acceptance letter from Centenary Collegiate Institute, a seminary in Hackettstown, New Jersey, in October 1890. Centenary was founded by the Newark Methodist Episcopal Church in 1867. It was built at a cost of $200,000. George H. Whitney, D.D., was president from 1869 to 1895. In September 1884 the tuition and board was $275 for 36 weeks. Your favor is rec. We shall be glad to have you come on the 3rd of Dec., the day of our term opening. I enter your name for that time, we shall be glad to do what we can for you.